Brian Bomeisler (born in 1952 in Palo Alto, California) received a Bachelor of Fine Arts degree from Pratt Institute in Brooklyn, New York in 1975, and has been a working and exhibiting artist in New York City. In 1985, he received a Fellowship from the National Endowment for the Arts, and his paintings are in museum collections (including the Museum of Contemporary Art San Diego and The Hyde Collection, New York), as well as in corporate and private collections around the world. Brian taught alongside Betty Edwards since 1988; and since her retirement in 1998, he has been teaching the Drawing on the Right Side of the Brain® Drawing and Painting Workshops worldwide. 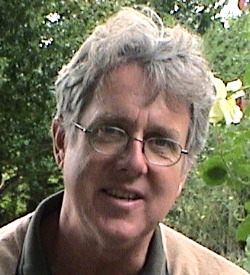 Visit www.drawright.com to learn more about his teaching or sign up for a workshop. On this page, you can see some of his demonstration drawings: Bomeisler Portrait Drawings. His students call him a "gifted teacher," who can explain clearly the DRSB theories of Betty Edwards and also demonstrate in practice how they work. There are hundreds of examples of striking "before" and "after" drawings created by students in Brian's classes, who are taught to draw in only five days. He also lectures and teaches workshops in corporations, helping executives tap into their creativity and problem-solving abilities. To read comments about his teaching, written by some of Brian's former students, CLICK HERE. In addition to his work with DRSB, Brian also been an instructor at the New York Academy of Art and other art schools. Some of his illustrations appear alongside the text in Drawing on the Right Side of the Brain®. Brian has lived in Soho (New York City) since 1975, and has traveled widely around the world. Among their many talents, his daughters Sophie and Francesca are both skilled artists.